We making plans to celebrate National ParkRx Day on April 29th. This annual event promotes the growing movement of doctors prescribing outdoor activity in parks and nature to their patients to improve health. Additionally, National ParkRx Day encourages everyone to recognize that physical activity, even walking throughout your own city’s parks and trails, is an important part of being healthy. Healthy People Healthy Trails is a local version of ParkRx here in Santa Barbara County. A dynamic group of community partners—including Sansum Clinic, Santa Barbara County Trails Council, CenCal Health, Cottage Health, City of Santa Barbara Parks and Recreation, and others—have come together to collaborate on an innovative Healthy People Healthy Trails program designed to strengthen the connection between the use of local public parks and trails and individual good health. Celebrate #ParkRxDay with a walk in the garden with Nutritionist Gerri French and COAST, Coalition for Sustainable Transportation, on Wednesday April 25, 5:30 to 7:00 pm. Details here. Celebrate #ParkRxDay with a walk at Baron Ranch with Santa Barbara County Supervisor Joan Hartmann on Saturday April 28. Details here. Celebrate National #ParkRx Day on April 29th by taking a walk in a local park. Doctor’s orders! Check out healthypeoplehealthytrails.org/easy-hikes/ to learn where to find easy walks and trails in Santa Barbara County. A big part of celebrating National Park Week is celebrating your health! This year for #ParkRx Day, Connect to an active life, and connect to the outdoors! Visit healthpeoplehealthytrails.org/event/ for a Trail Guide of easy walks and trails in South Santa Barbara County. Being active improves your physical health and your emotional well-being. For this year’s #ParkRx day, take a walk on a local trail or in a local park. Visit helathypeoplehealthytrails/easy-hikes/ to learn more. It’s National #ParkRx Day! 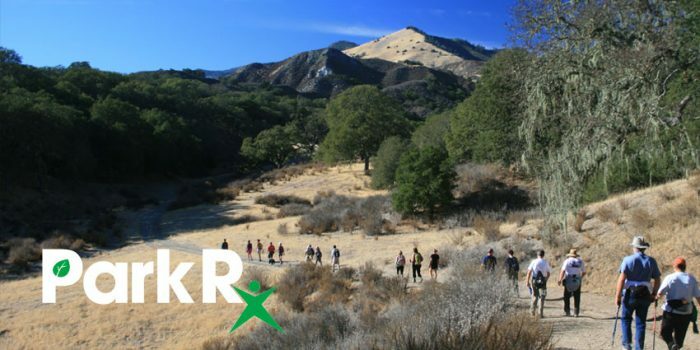 Get involved with your local ParkRx program, Healthy People Healthy Trails in Santa Barbara County. Visit healthypeoplehealthytrails.org to learn more about the program.